Commercial and industrial firms today use VFD systems for a variety of applications. Most common of these include standard pumps, fans, and blowers. Newer applications include hoists and cranes, conveyors, machine tools, film lines, extruders, and textile-fiber spinning machines. Many applications have unique demands and characteristics. New generation variable frequency drives have evolved with advancements in solid-state electronics. Variable frequency drives can now be applied to ac motors regardless of motor horsepower or location within a facility and can be used to VFD almost all types of motorized equipment, from a small fan to the largest extruder or machine tool. Commercial and industrial facilities can expect to dramatically reduce both energy consumption and operating and maintenance costs while offering improved operating conditions by using new generation electronic variable frequency drives. The latest generation of variable frequency drives allows ac induction motors to be just as controllable and efficient as their dc counterparts were. The term variable implies a change that may or may not be under the control of the user. The term frequency can only be applied to VFDs with an ac output, Thus, the term most commonly accepted is VFD. 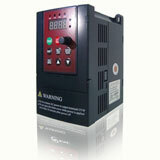 Most variable frequency drives consist of three basic parts. A rectifier that converts the fixed frequency ac input voltage to dc. An inverter that switches the rectified dc voltage to an adjustable frequency ac output voltage. (The inverter may also control output current flow, if desired.) The dc link connects the rectifier to the inverter. A set of controls directs the rectifier and inverter to produce the desired ac frequency and voltage to meet the needs of the variable frequency drive system at any moment in time. 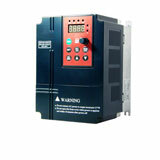 The benefits of variable frequency drives do not stop with saving energy and improving control. Variable frequency drive technology can now be applied to manufacturing equipment previously considered too expensive or uneconomical. Such basic applications are often unique to a particular industry and its equipment, or even to a particular facility. Cost benefits, such as those obtained from improved quality, may be desirable for each application.